July 12. Born in Chadds Ford, PA at the home of his parents, Carolyn Bockius Wyeth and Newell Convers "N. C." Wyeth. 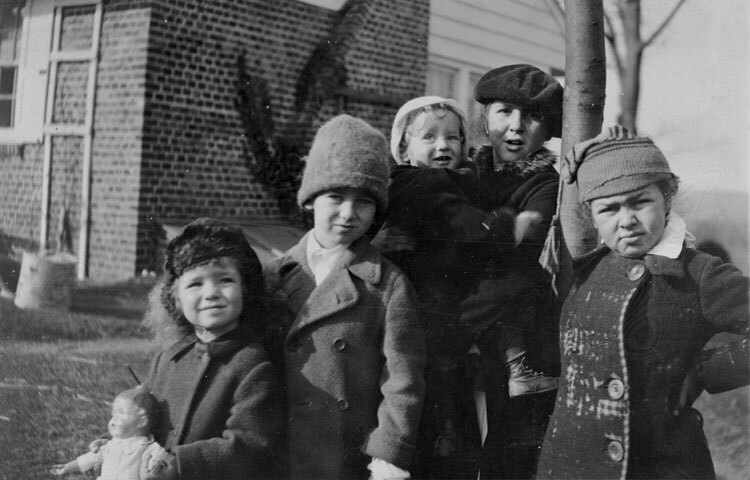 Wyeth is the last of five siblings - Henriette (born 1907), Carolyn (born 1909), Nathaniel (born 1911), and Ann (born 1915). His health is fragile enough to convince his parents to remove him from public schooling before he completes the 1st grade. He is instructed by private tutors, older relatives, and personal exploration in a family that prizes imagination and creativity. They spend each summer in Port Clyde, Maine. N. C. decides that Andrew is ready for a formal art education. 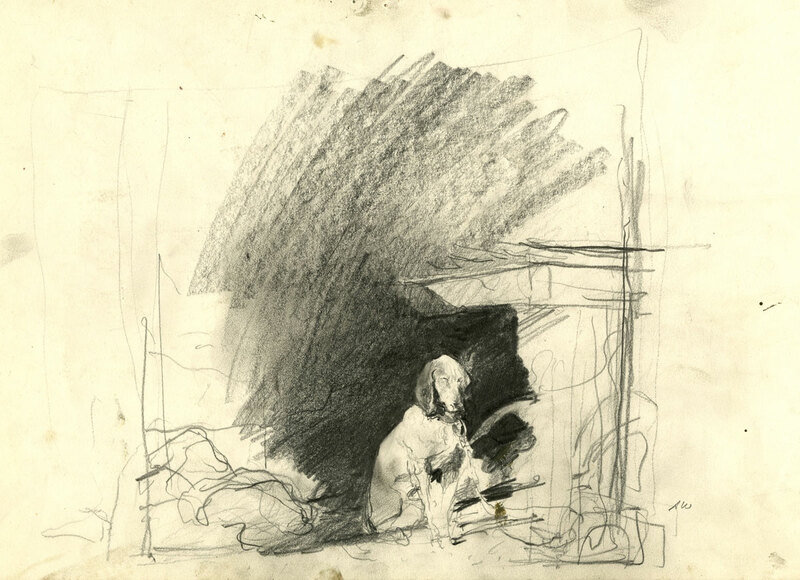 In his father’s studio, traditional training includes drawing geometric forms, still lives and figure models from life and again from memory. 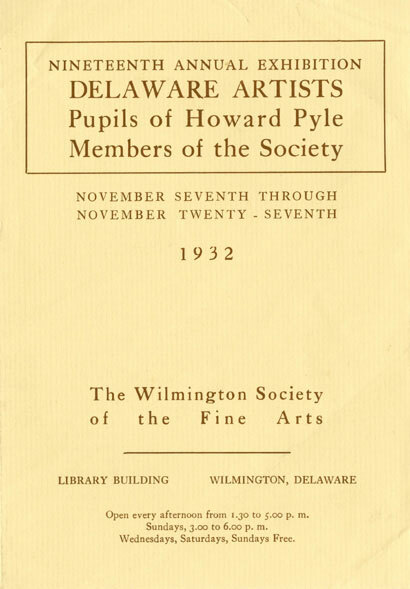 Nineteenth Annual Exhibition – Delaware Artists, Pupils of Howard Pyle, Members of the Society, The Wilmington Society of the Fine Arts, Wilmington DE November 7 – 27, 1932. This exhibition marks the artist’s first public exhibition of his work. 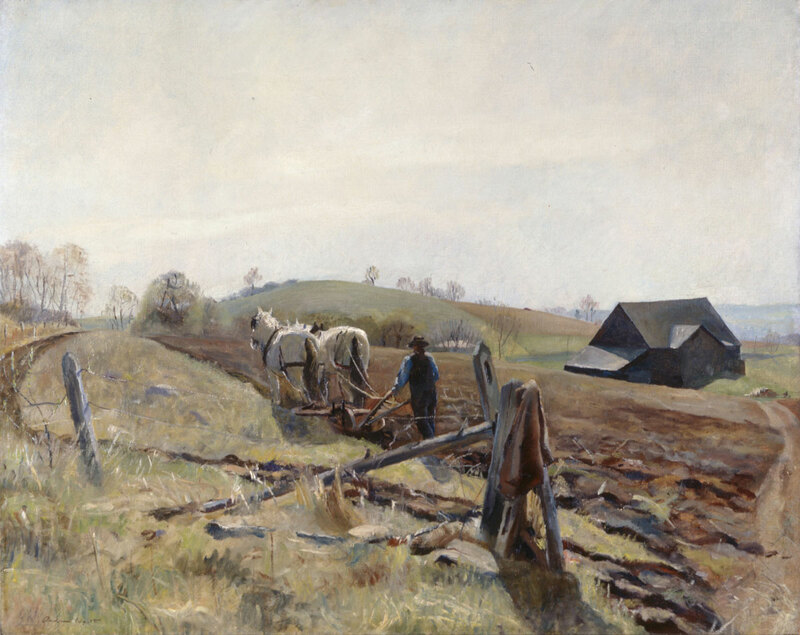 The artist begins working at the Kuerner Farm in Chadds Ford, Pennsylvania. The nearby property owned by German immigrants, Karl and Anna Kuerner, will be a major theme in the artist's work for the rest of his life. 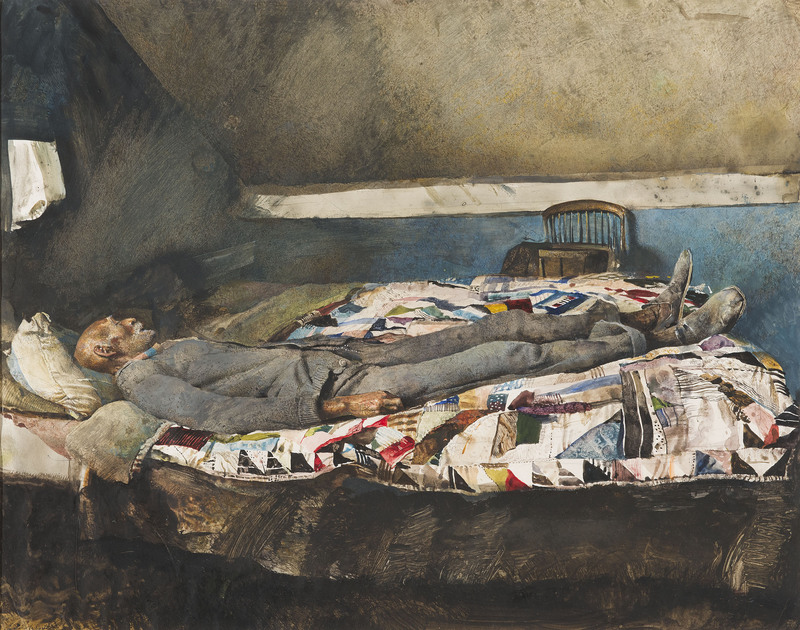 Work by the Wyeth Family, Philadelphia Art Alliance, Pennsylvania March 25 – April 19, 1935. The artist’s father N.C. and sisters Henriette and Carolyn all represented the family here. 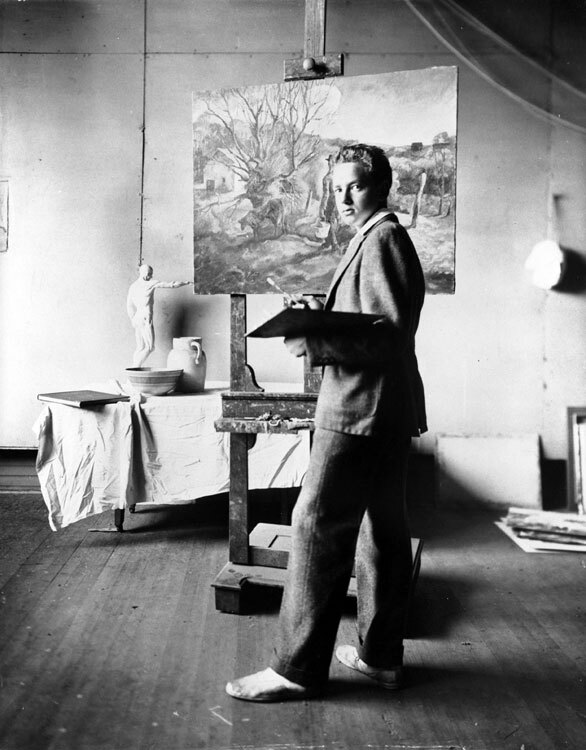 Peter Hurd, Wyeth’s brother-in-law and also a student of N.C., introduced the medium of tempera to the Wyeth family. 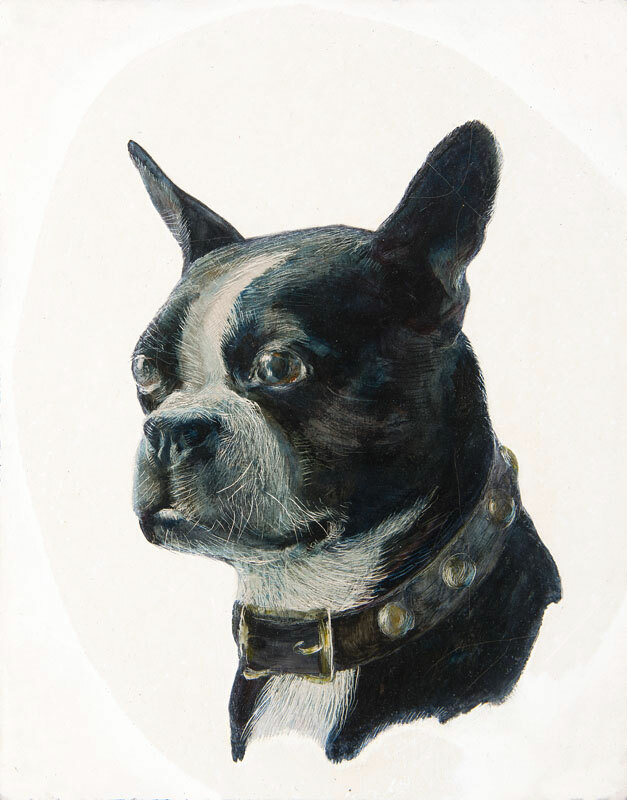 The three painters experimented with the technique and the younger Wyeth’s first completed tempera painting was a portrait of Lupe, his Boston terrier. 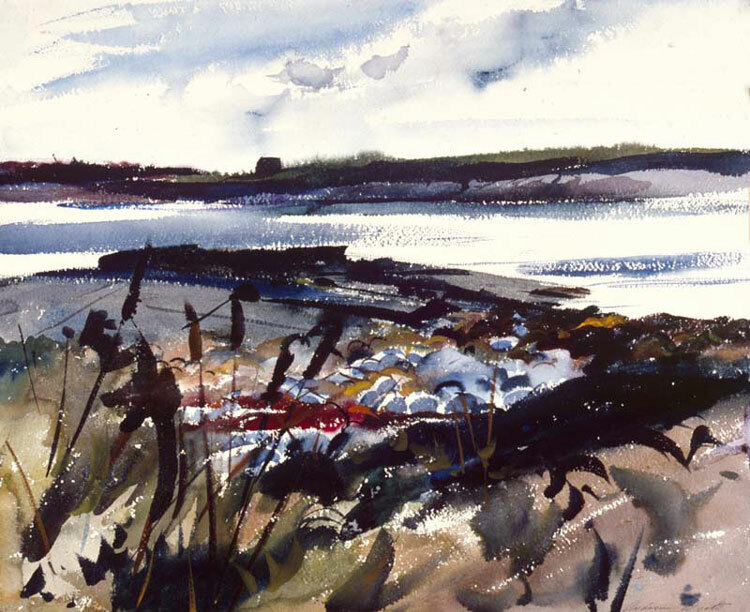 Water Colors by Andrew Wyeth, Macbeth Gallery, New York October 19 – November 1, 1937. First one-man exhibition sold all displayed work by October 21. 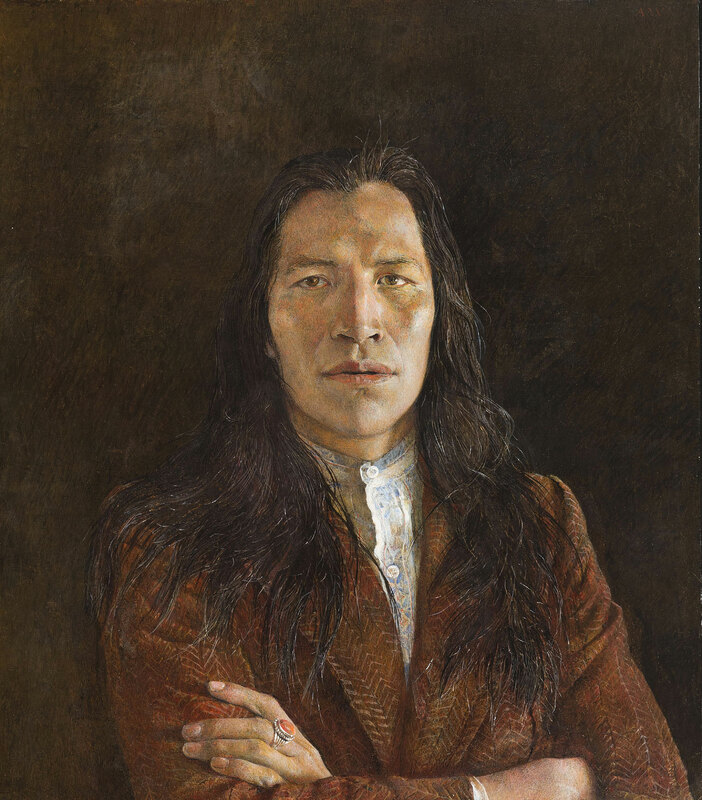 Robert Macbeth was to be Wyeth’s primary dealer for decades. Correspondence regarding the artist and the gallery can be read at the Archives of American Art in Washington. Cat-O'-Nine-Tails, 1938 watercolor on paper, 18 in. x 22 in., Currier Museum of Art, The Henry Melville Fuller Acquisition Fund, 2004.41. The artist meets Betsy Merle James, daughter of a newspaper editor and painter from East Aurora, New York. The James family also spent summers in Maine. Betsy wasted no time introducing her new friend to her neighbors Alvaro and Christina Olson. All three would make indelible impressions on young Wyeth. 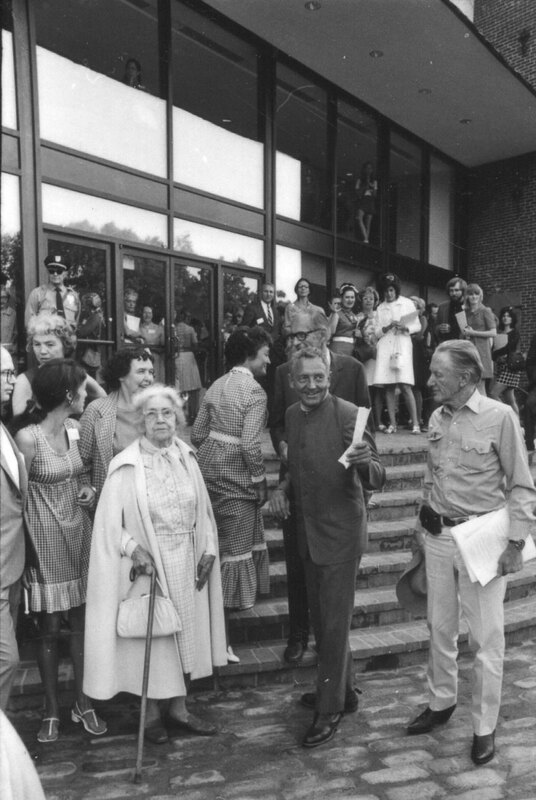 Andrew Wyeth and Betsy James marry in East Aurora, New York. The newlyweds live in a converted schoolhouse building at the foot of the driveway to Wyeth's childhood home. The artist establishes his studio in one room of the house. May 3 – May 24, Delaware Art Center, Wilmington, Delaware. 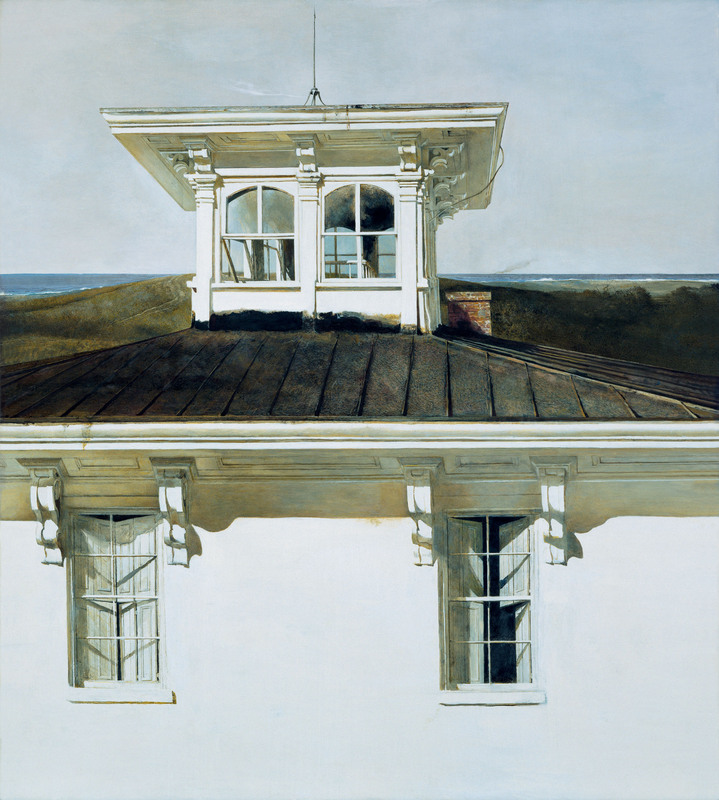 Wyeth meets the artist Edward Hopper, a fellow realist admired by Wyeth and a juror for this exhibition. 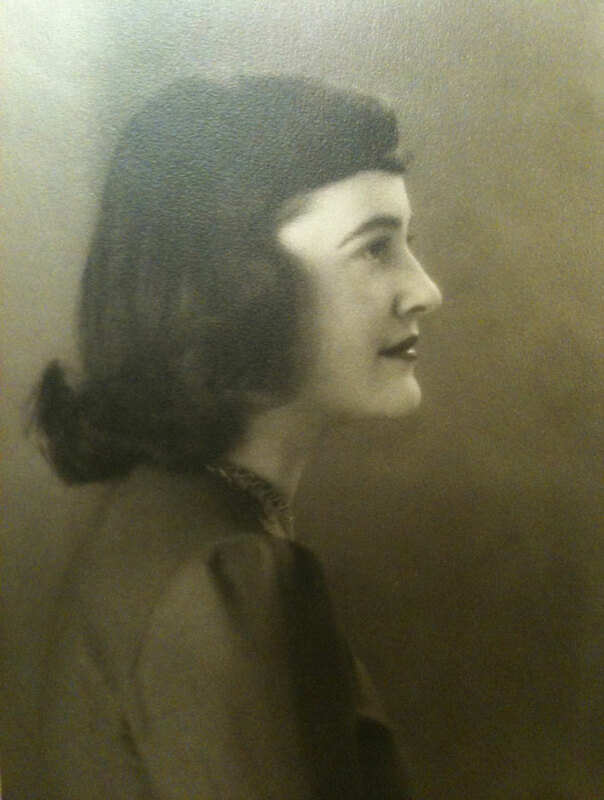 The painter Josephine “Jo” Hopper, Edward’s wife, catalogues her husband’s work and explains her process to Betsy Wyeth. Betsy's similar records are the first steps in the archives that anchor Andrew's catalogue raisonné, a work still in progress. Albright-Knox Gallery, Buffalo New York April 4 – May 5, 1943; Minneapolis Museum of Art, Minnesota June 1 – 30, 1943; San Francisco Museum of Art, California August 23 – September 19, 1943; Toronto Art Gallery, Canada November 12 – December 19, 1943; Cleveland Museum of Art, Ohio January 6 – February 6, 1944. First son, Nicholas, is born. Work began on this tempera shortly after N. C. died. The scene is Kuerner’s Hill near the site of the crash. 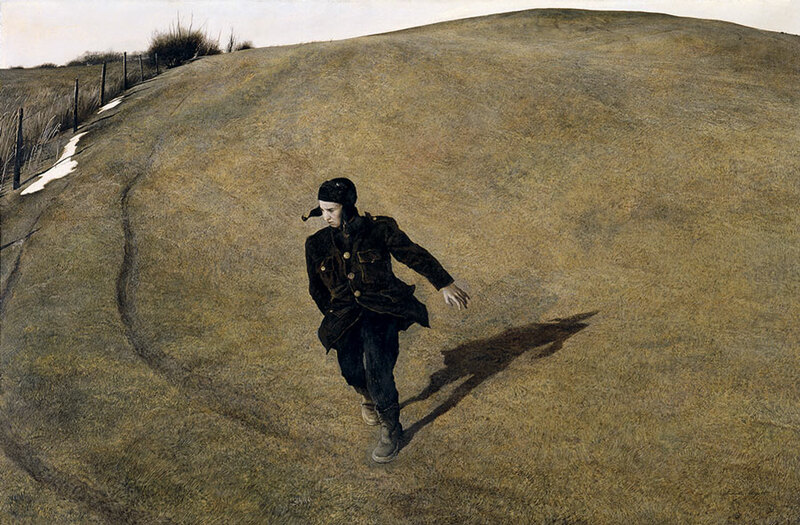 Later, Wyeth said, "The boy was me at a loss, really." Winter, 1946, 1946 tempera on panel, 31.375 x 48 in., North Carolina Museum of Art, Purchased with funds from the State of North Carolina. 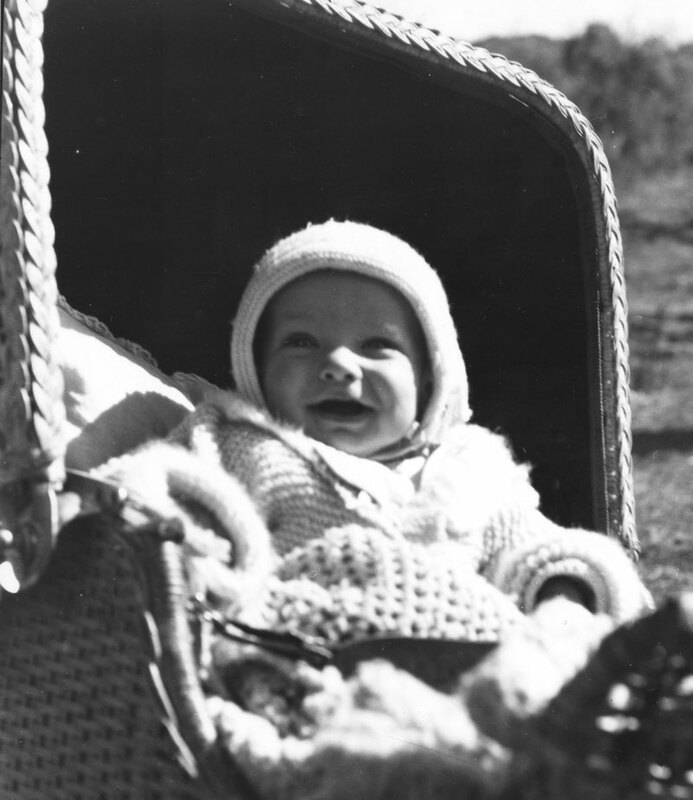 Second son, James Browning, is born – he will commonly be known as Jamie. 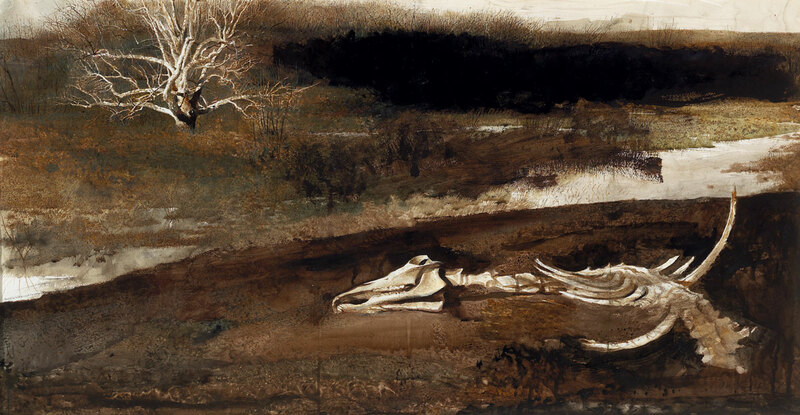 April 8 – 20, Andrew Wyeth, Pennsylvania Academy of Art, Philadelphia. May 22 – June 30, Works by Newly Elected Members and By Recipients of Academy and Institute Honors, American Academy of Arts and Letters, New York. Four Poster, Study for Arthur Cleveland 1946 drybrush on paper 40 x 29.5 in. is now in the collection of the Greenville County Museum of Art and was exhibited at both shows. The artist's best known work is completed in September 1948. The view of Christina Olson at her farm is representational, yet manipulated. Betsy served as a model - creating a composite figure, a technique that the artist would use throughout his career. 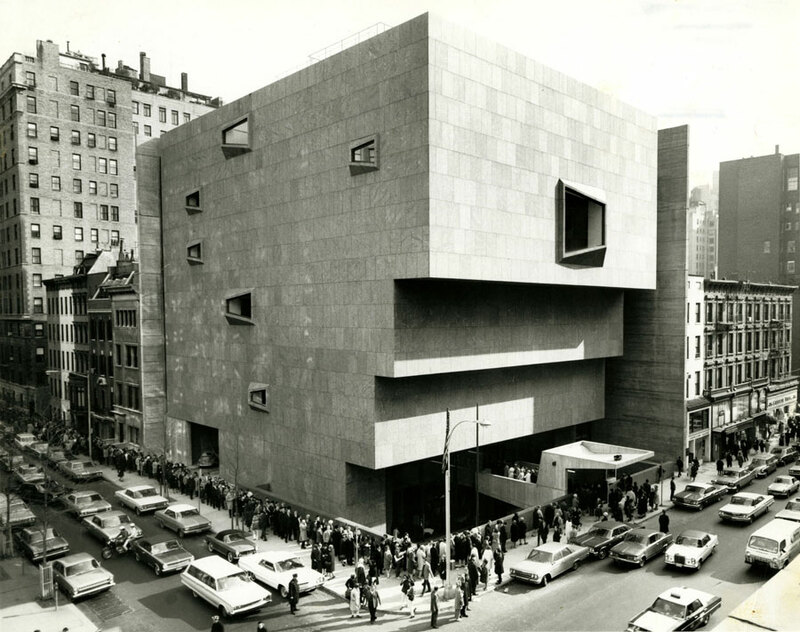 The Museum of Modern Art acquires the work in December, just months after its completion. 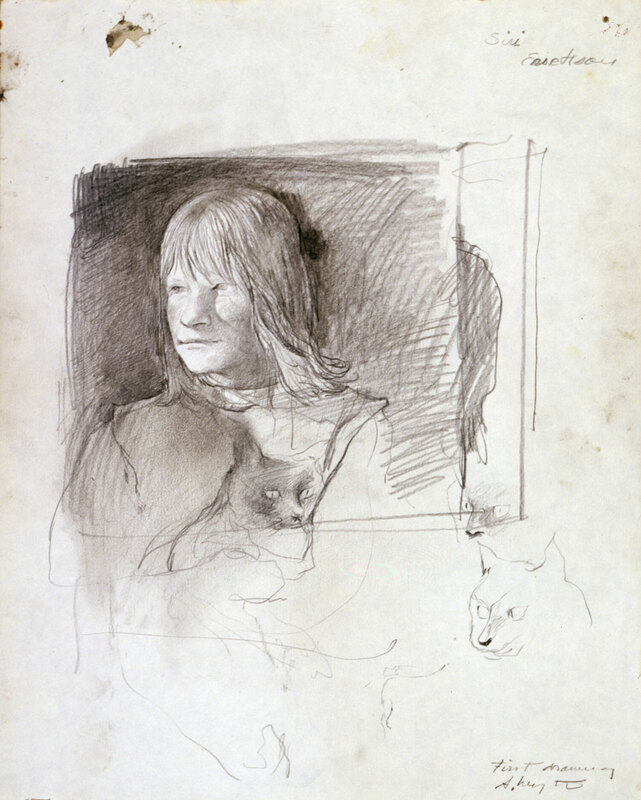 “Andrew Wyeth Paints a Picture”, Elaine deKooning. Art News, March 1950 p. 38-41, 54-56." The artist has surgery to remove a large portion of one lung due to an incurable respiratory disease. 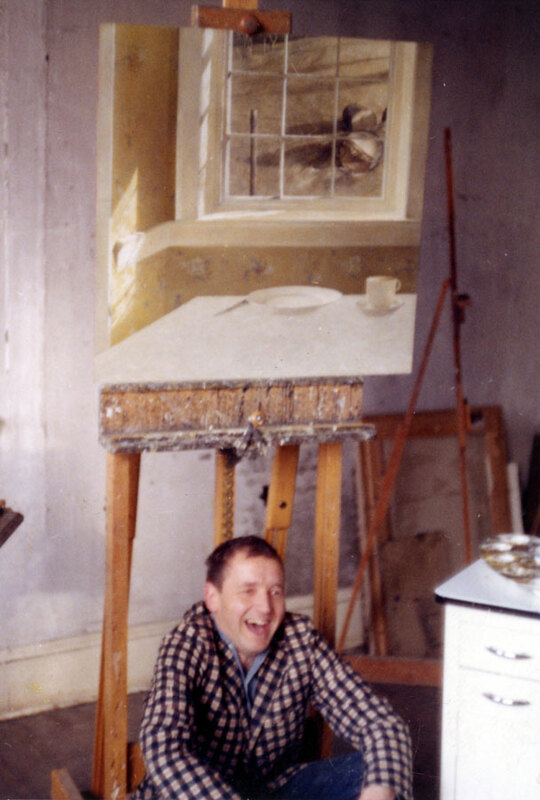 In a matter of weeks, Wyeth is at work again despite two near death experiences and the necessity to cut through muscles in his painting arm. 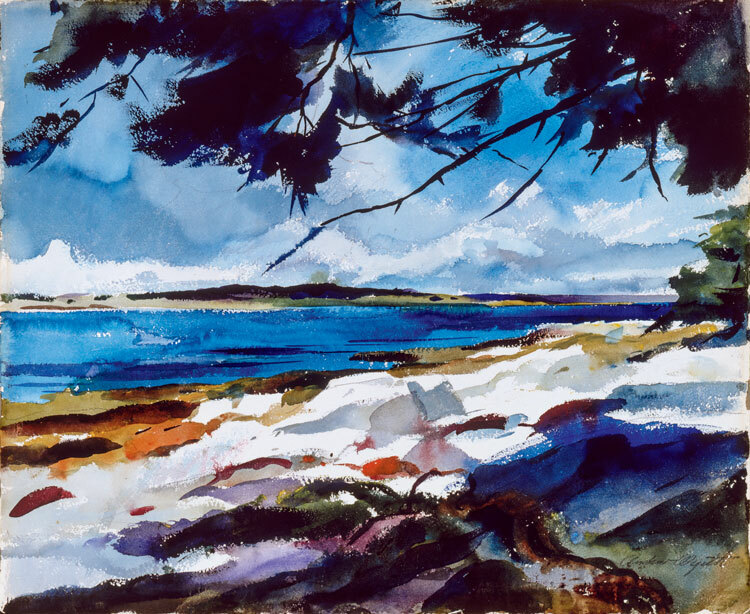 Paintings and Drawings by Andrew Wyeth Currier Gallery of Art, Manchester, NH July 7 – August 4, 1951, William A. Farnsworth Library and Art Museum Rockland, ME August 10 – September 8, 1951. This two venue exhibition is his first major museum retrospective. 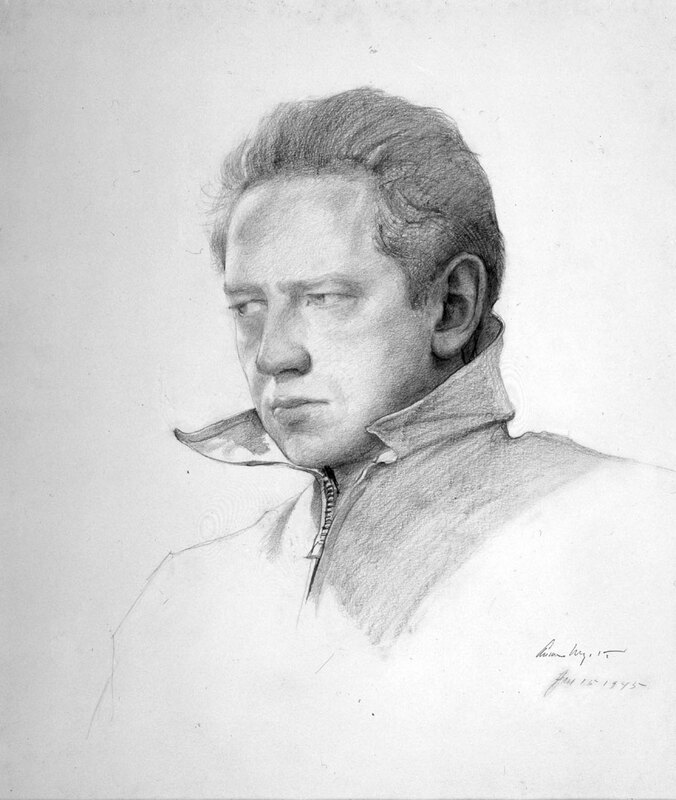 James Loper, 1951 pencil on paper 10.75 x 13.75 in. debuted here. The Mead Art Museum at Amherst College, MA purchased it the following year. 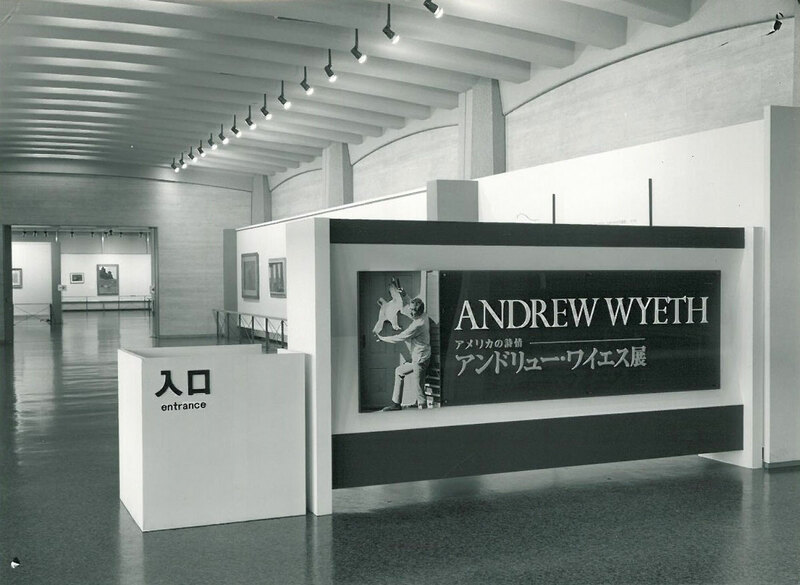 Andrew Wyeth, M. Knoedler & Company, Inc., New York October 26 – November 14, 1953. The artist joined M. Knoedler when Macbeth Galleries closed earlier this year. The Maine watercolor below, Roaring Spout, was among the first sold here. 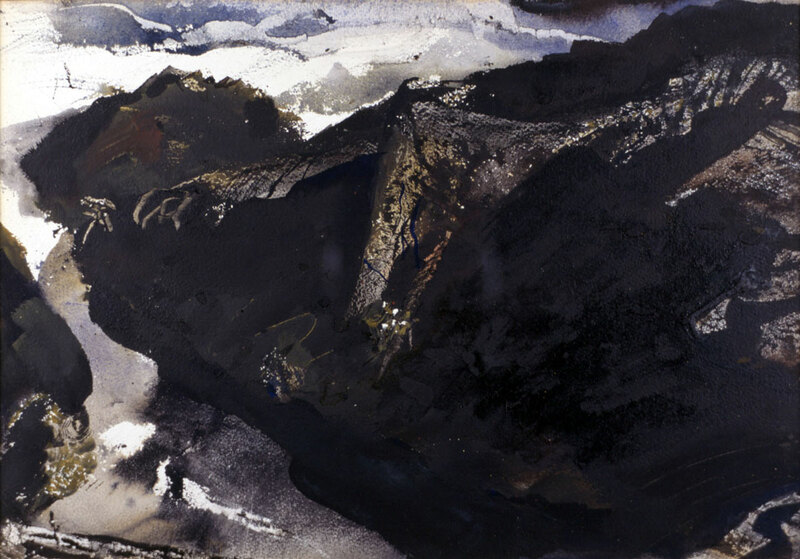 Roaring Spout, 1953 watercolor on paper 13.875 x 19.75 in. 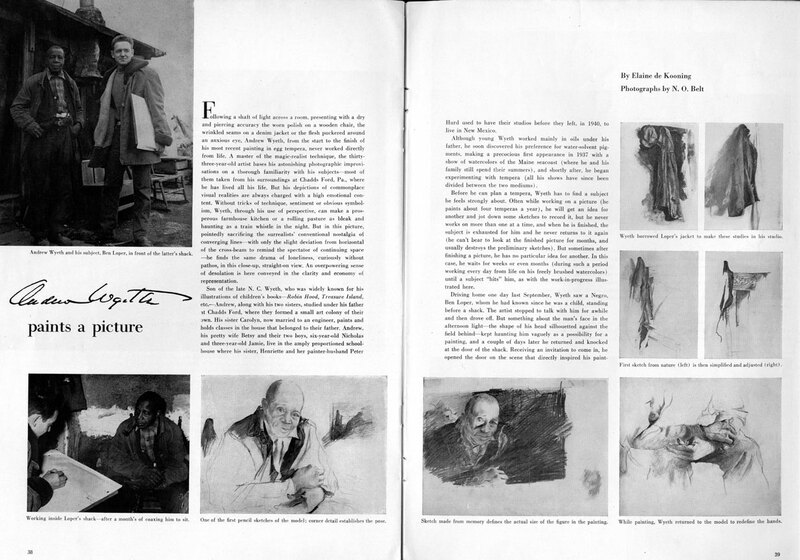 Private Collection, was one of the first Wyeth works by Knoedler. Wyeth is awarded his first honorary doctorate degree from Colby College in Waterville, Maine. The following year he received the same honor at Harvard University (below). In the decades to come he would accept 24 more doctorates. 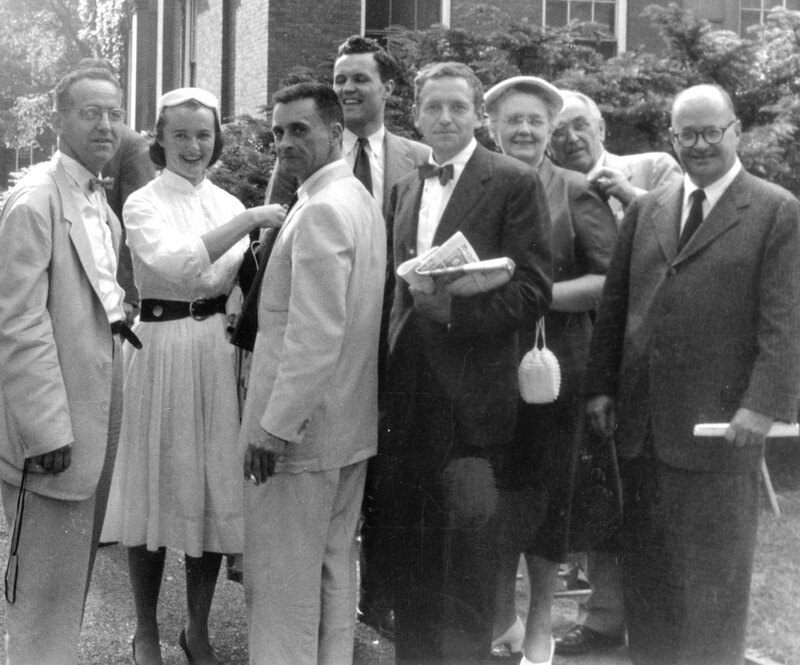 L to R: Nathaniel Wyeth, Betsy Wyeth, Hyde Cox, unknown, Andrew Wyeth, three unknown persons; photographer unknown. Andrew Wyeth, M. H. de Young Memorial Museum, San Francisco California July 12 – August 12, 1956; Santa Barbara Museum of Art, Santa Barbara California August 28 – September 23, 1956. Andrew and Betsy purchase and begin restoration of an 18th century mill complex along the Brandywine River in Chadds Ford. An American Artist article that November features artwork done on the site. With the completion of the mill restoration, the property becomes the family home. The artist retains his schoolhouse studio which will serve him for the rest of his life. 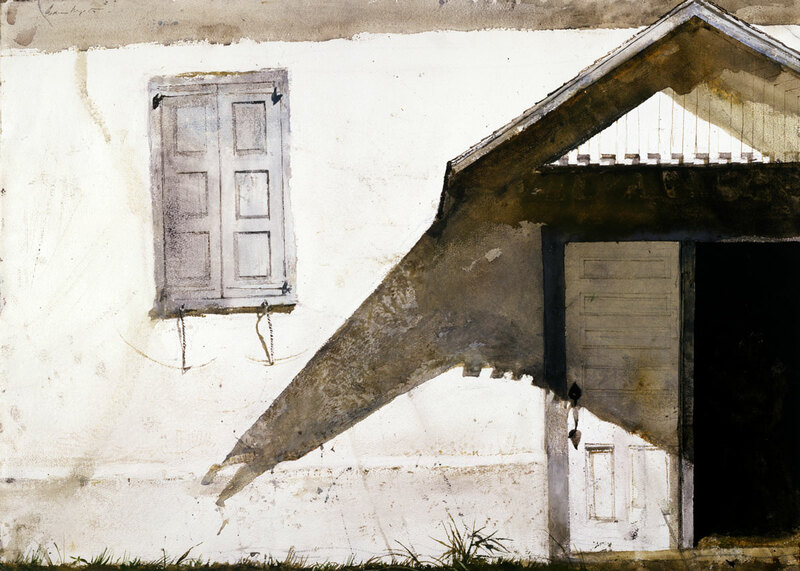 Andrew Wyeth, Temperas, Water Colors and Drawings, Buffalo Fine Arts Academy, Albright-Knox Art Gallery, Buffalo New York November 2 – December 9, 1962. June 16, 1963. The exhibition marked the first public showing of Garret Room, completed the previous year. 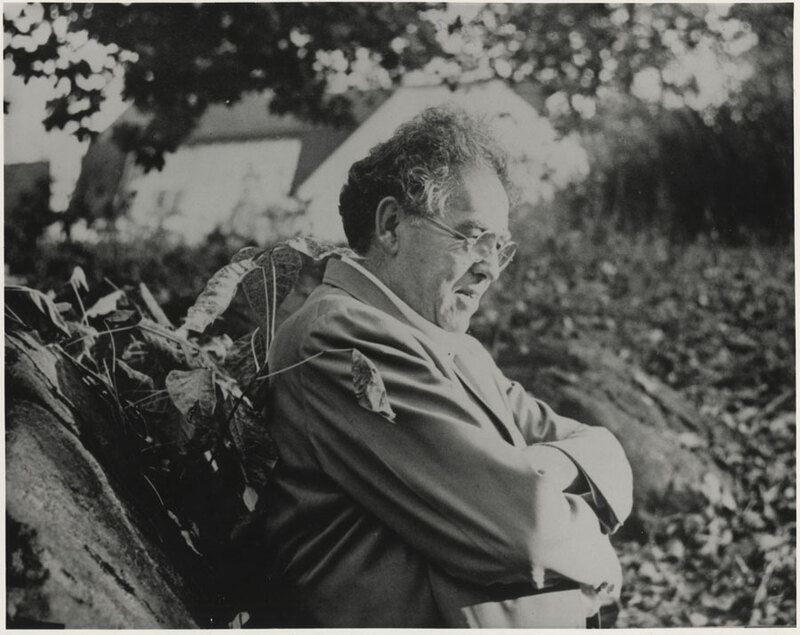 Richard Meryman's first article on Wyeth is published in Life. The journalist became a personal friend and wrote about the artist for the rest of his career. 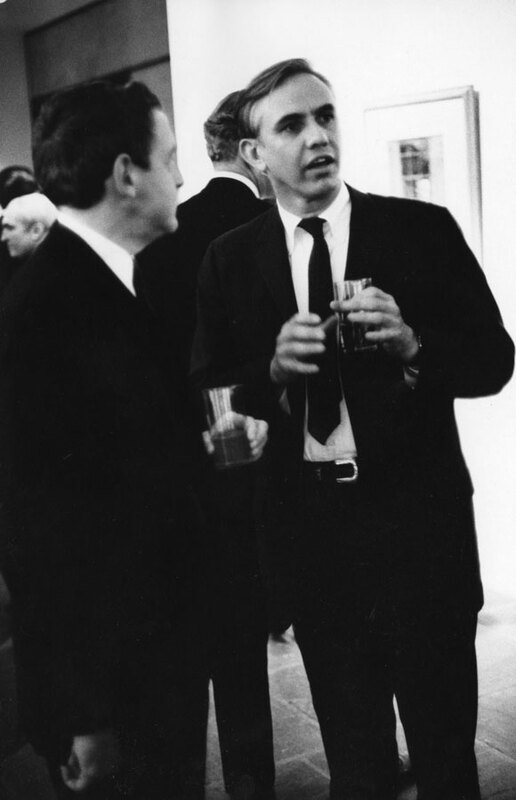 The two are shown here at an exhibition opening at The Whitney Museum of American Art in 1967. 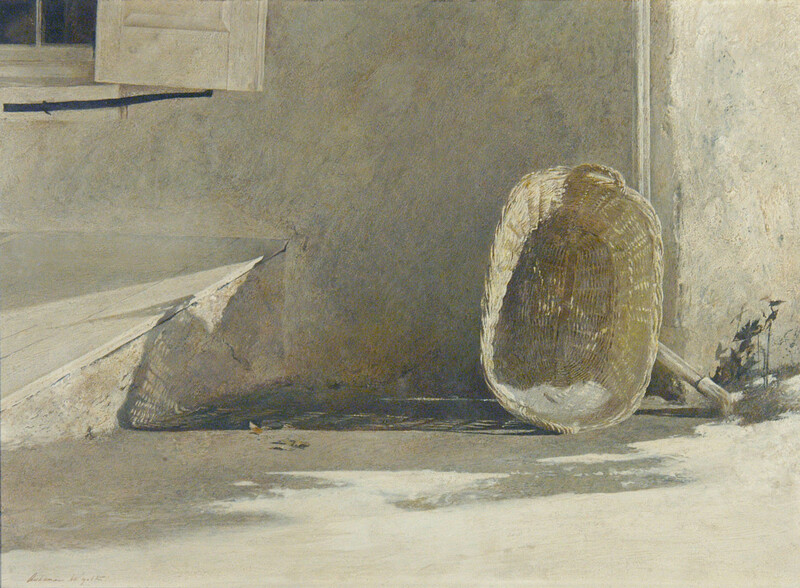 Andrew Wyeth – Temperas, Watercolors, Dry Brush, Drawings, 1938 – 1966 Pennsylvania Academy of the Fine Arts, Philadelphia October 5 – November 27, 1966; Baltimore Museum of Art, Baltimore Maryland December 11, 1966 – January 22, 1967; Whitney Museum of American Art, New York City February 6 – April 12 1967; Art Institute of Chicago, Chicago Illinois April 21 – June 4, 1967. A young girl from Maine became the artist’s next major model. 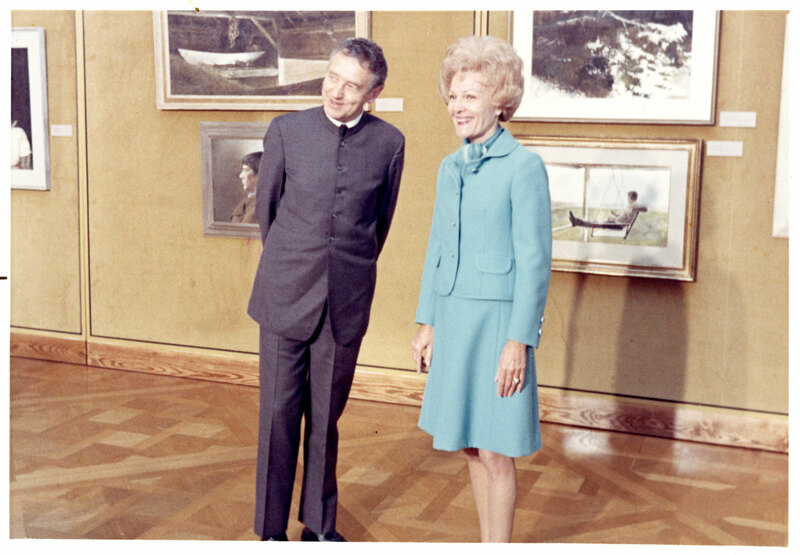 She and her Finnish father would pose for the artist through the 1970s. 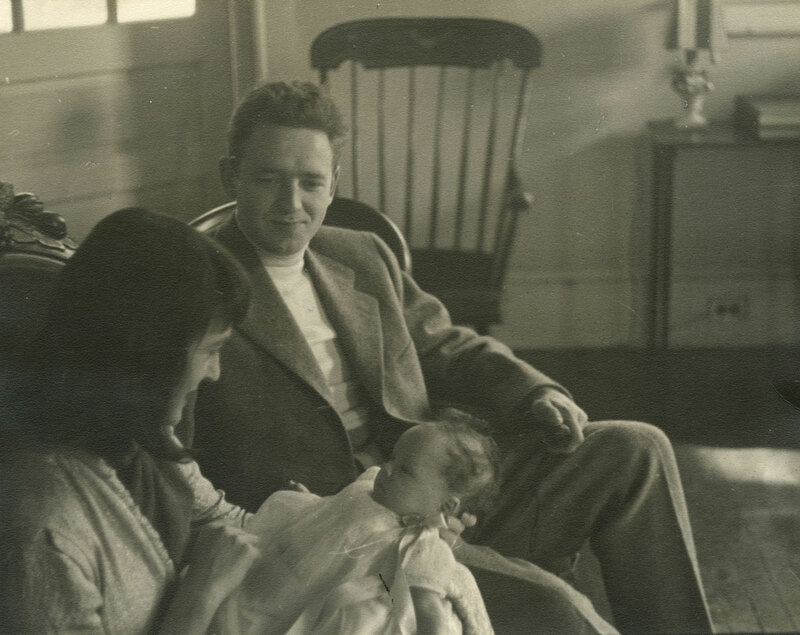 Alvaro Olson dies the day after Christmas and Christina follows on January 27, 1968. The last work at the Olson home is completed in September 1969 and the artist does not work on the property again. 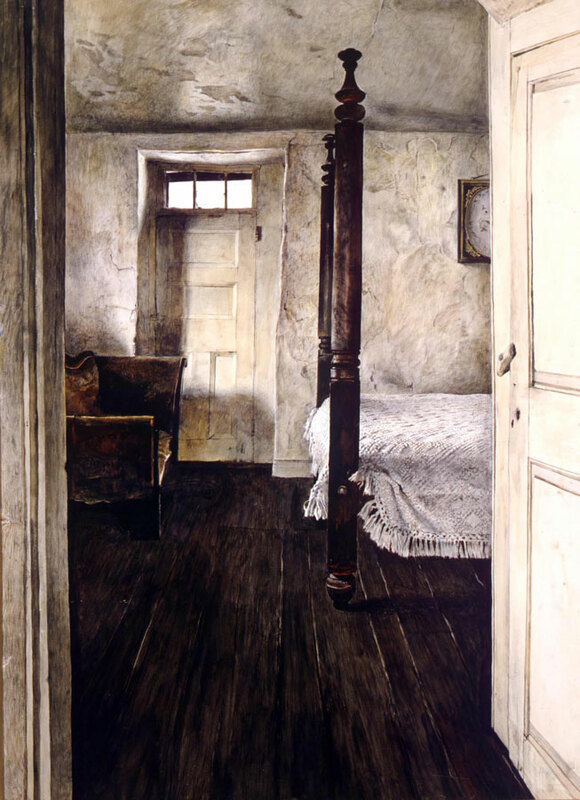 Andrew Wyeth, The White House, Washington DC February 19 – March 28, 1970. 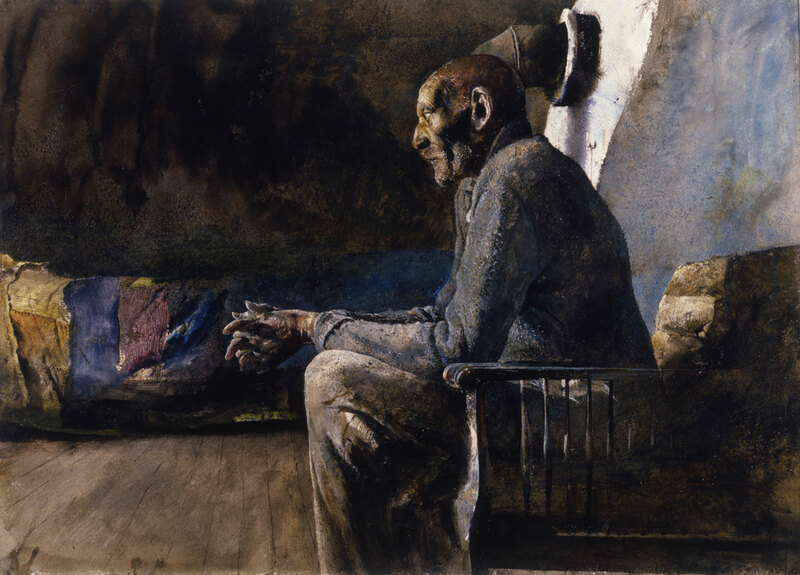 Though works by Wyeth had hung individually as loans to the residence, this 23-work exhibition was the first one-man show by any artist at the White House. 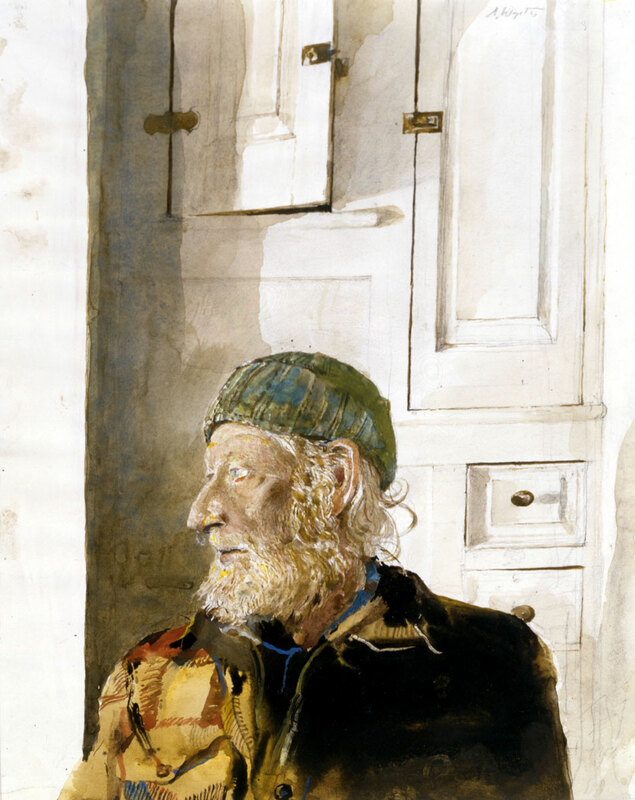 Wyeth People: a portrait of Andrew Wyeth as he is seen by his friends and neighbors, Gene Logsdon. New York: Doubleday & Co., Inc., 1971. Reissued by Swallow Press, 2003. Logsdon visited and interviewed several of the artist’s models, including Karl Kuerner. 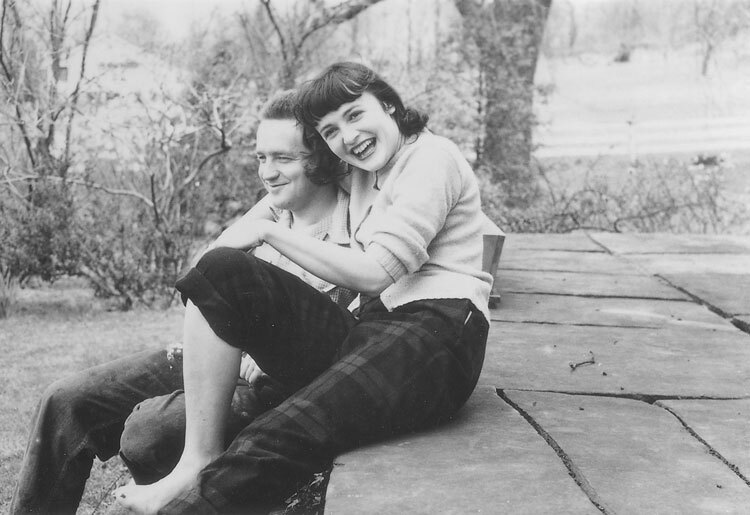 He is pictured here with his wife, Anna. 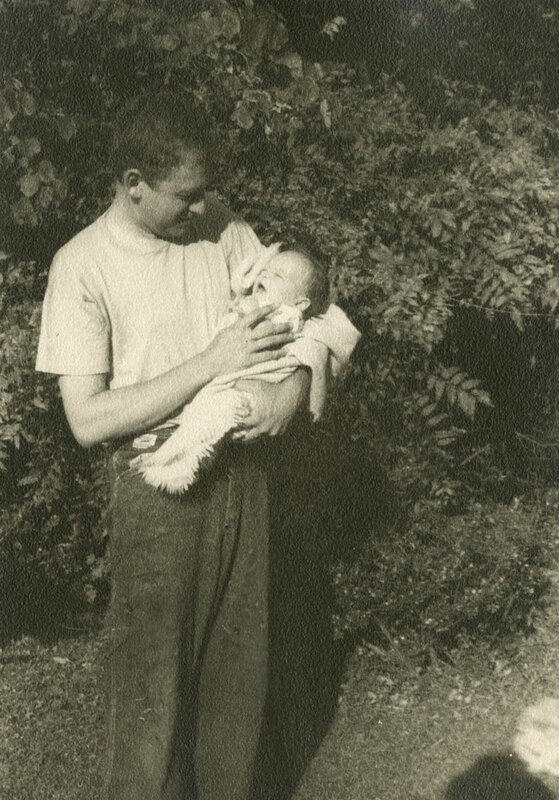 Helga Testorf, a neighbor of the Kuerners, meets the artist. He begins drawing her in a secret project that will continue into the 1980s. 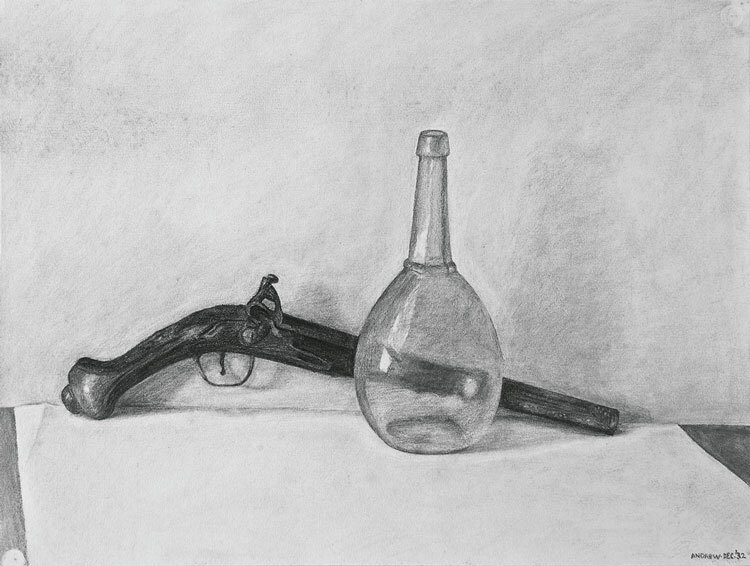 First Drawing, 1971 pencil on paper 14 x 11 in. 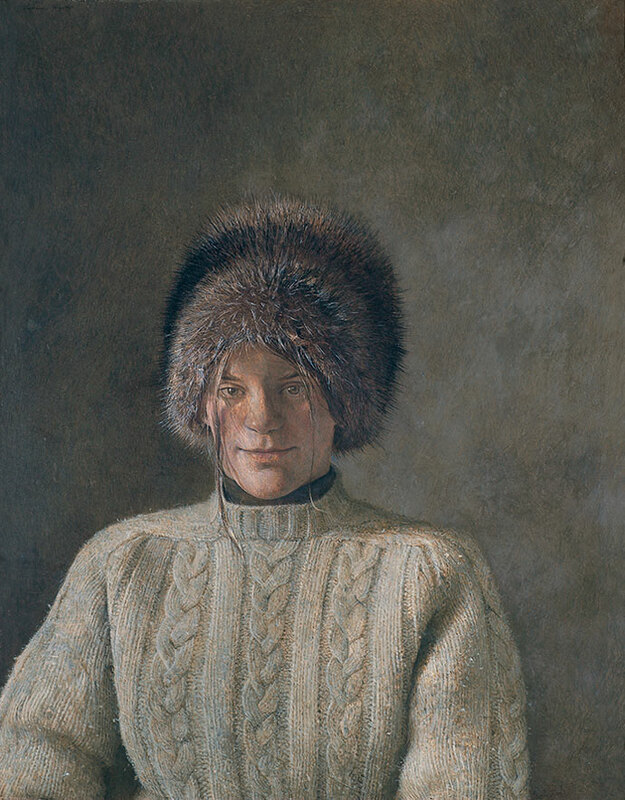 Carolyn Bockius Wyeth dies at age 86. Night Mare, completed this year, reveals mortality on the artist’s mind. The Fine Arts Museums of San Francisco, California June 16 – September 3, 1973. 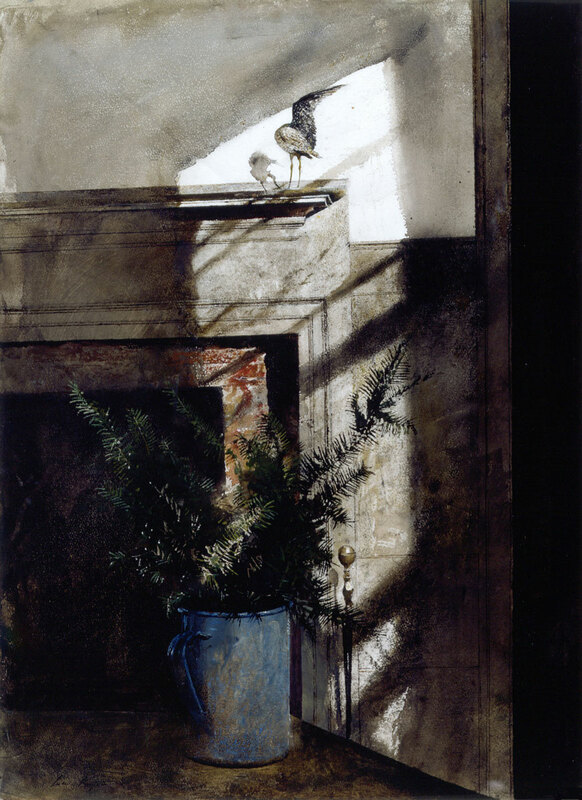 Catalogue by Wanda Corn, New York Graphic Society Ltd., Greenwich, CT.
Andrew Wyeth The Lefevre Gallery, London. May 23 – June 22, 1974 – catalogue by Perry T. Rathbone. 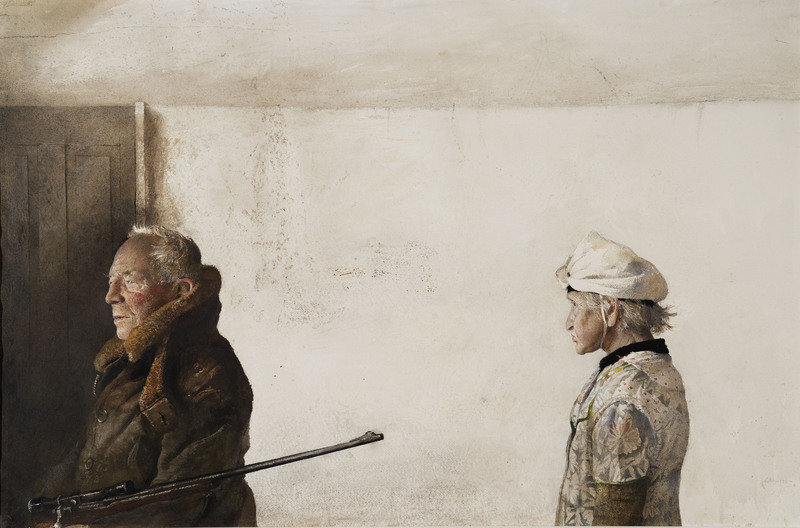 Two Worlds of Andrew Wyeth: Kuerners and Olsons, Metropolitan Museum of Art, New York October 16, 1976 – February 6, 1977 was the first solo exhibition by a living artist presented by the Met. 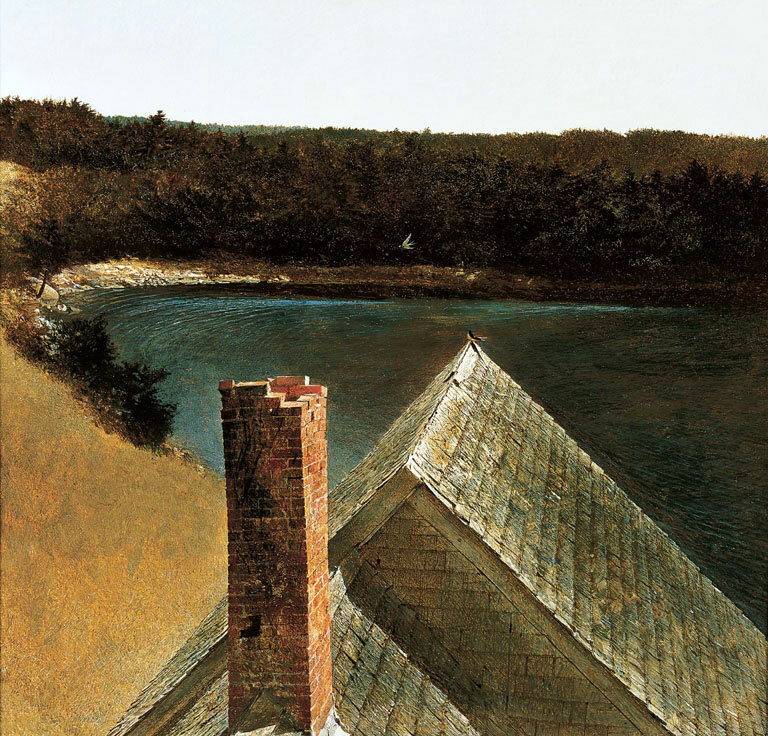 Wyeth and then-director Thomas Hoving would collaborate for years to come. Elected to Associate Membership of the Académie des Beaux-Arts, Institut de France, Paris. Wyeth makes his only overseas trip to accept the honor in May 1978. He and John Singer Sargent remain the only two Americans ever welcomed into the Académie. 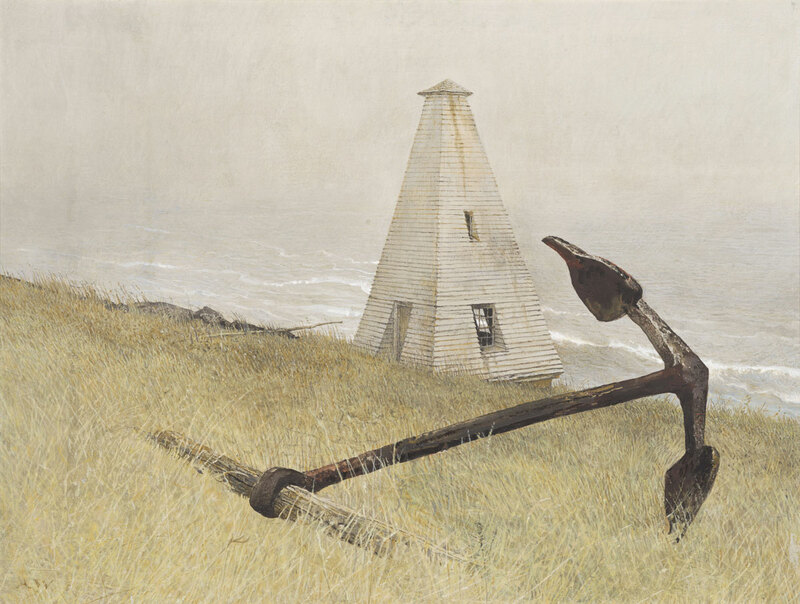 Andrew and Betsy Wyeth purchase Southern Island. Buildings extant on the island include a lighthouse and distinctive bell tower. 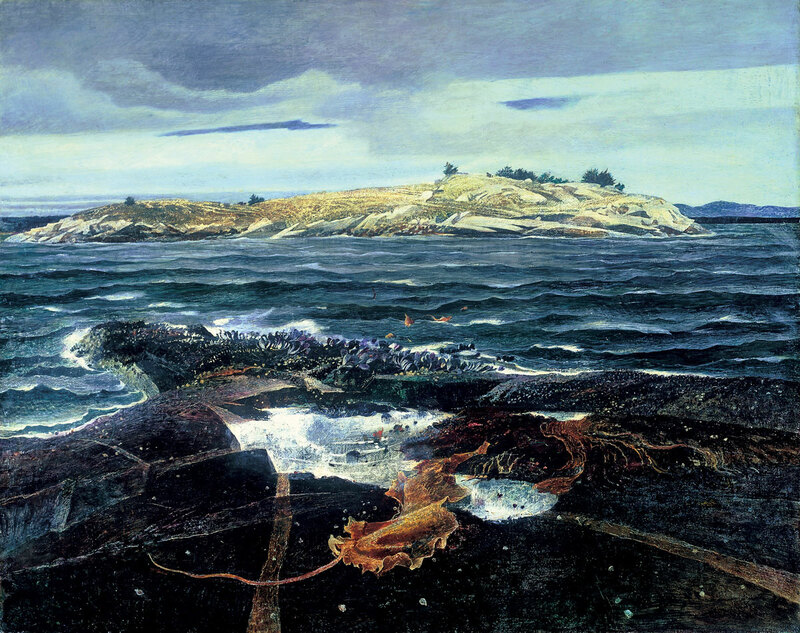 The island becomes the setting of many Maine paintings including Sea Running. Karl Kuerner dies at age 80. 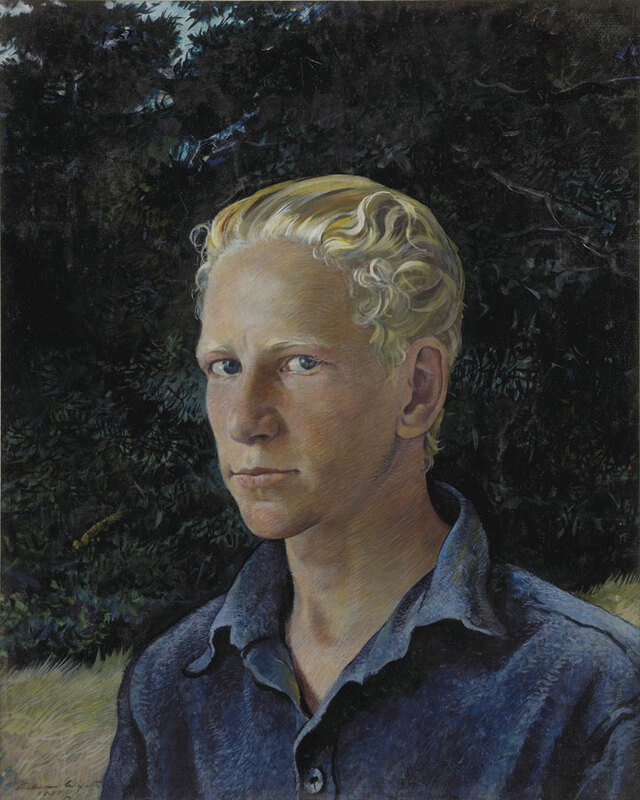 Wyeth had created a final portrait of Karl during his illness, Spring, in 1978. Andrew Wyeth Royal Academy of the Arts, London June 6 – August 31, 1980 is the first exhibition by a living American artist at the Royal Academy. Temperas, Aquarelles, Drybrush, Dessins Galerie Claude Bernard, Paris December 2, 1980 – January 31, 1981. Christina’s World and Wyeth at Kuerners by Betsy James Wyeth are released. Each book of reproductions highlights artwork done on the Kuerner or Olson farms. Many informal studies of each of these favorite locations are arranged to allow the reader to follow the artist’s method from inspiration to the final version of the work. Published in Boston by Houghton Mifflin Co. The Helga Pictures National Gallery of Art, Washington DC May 24 – September 27; Museum of Fine Arts, Boston October 28, 1987 – January 3, 1988; The Museum of Fine Arts Houston January 31 – April 4, 1988; Fine Arts Museum of San Francisco August 13 – October 16, 1988; Detroit Institute of Arts November 13, 1988 – January 22, 1989; Brooklyn Museum of Art, New York June 19 – September 18, 1989. 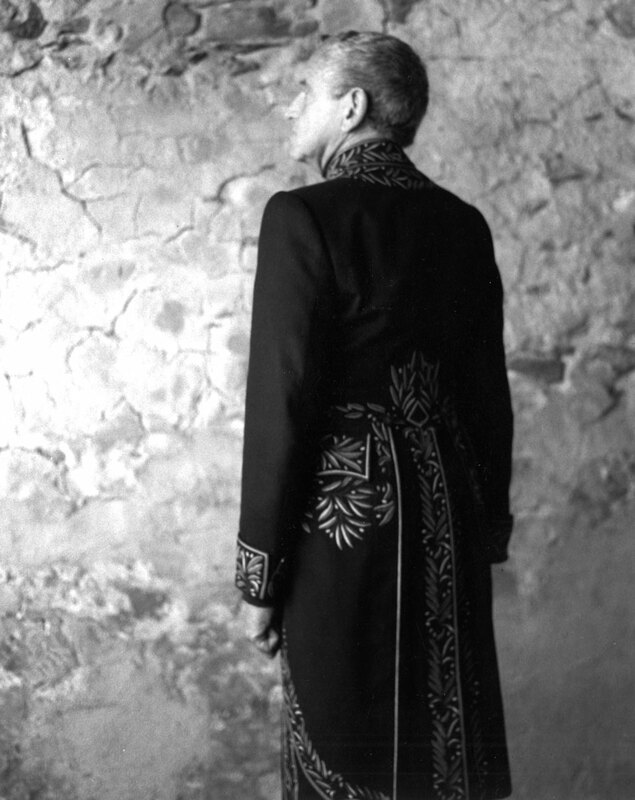 Longtime friend and model Walt Anderson dies. 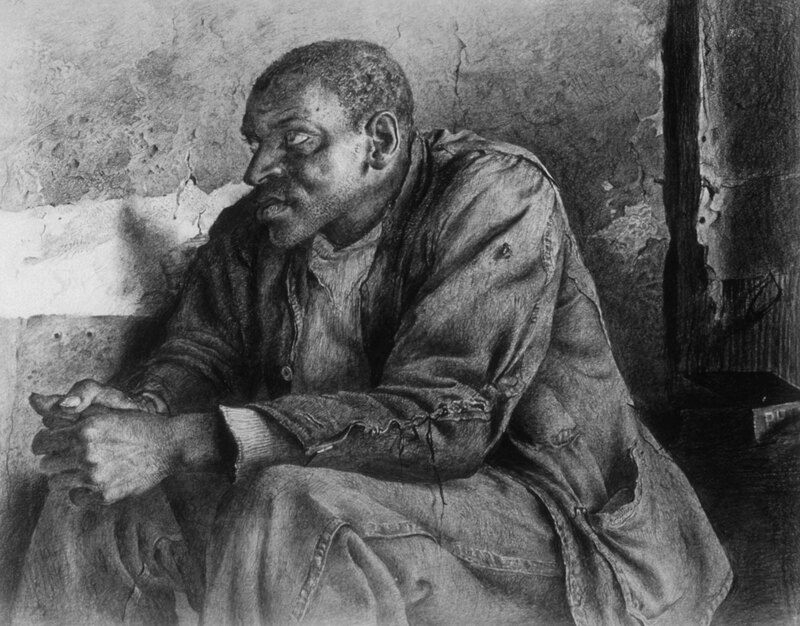 The portrait of him completed this summer is titled Weatherbeaten. 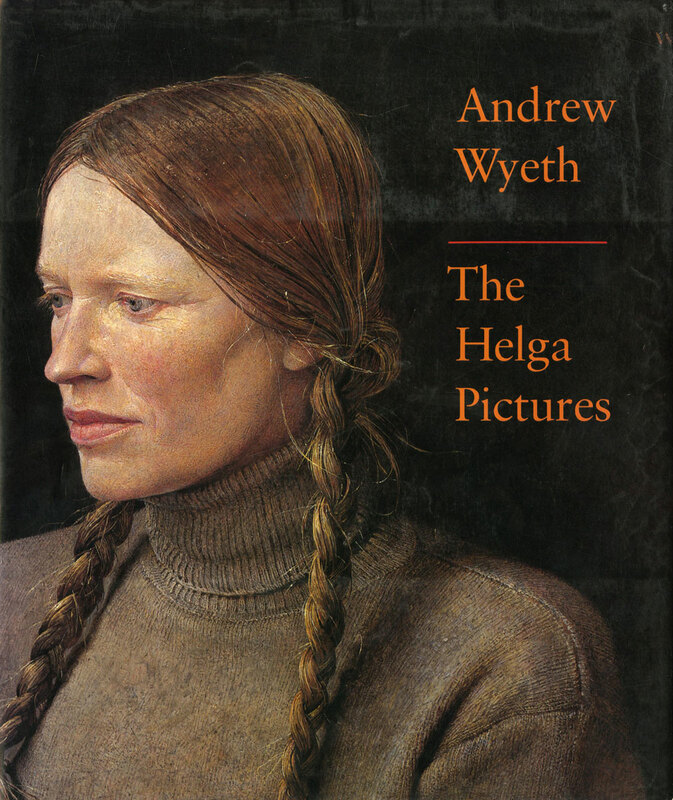 “Wyeth Since Helga”, by Thomas Hoving is published in the magazine Connoisseur. Few interviewers could coax a story from Wyeth better than Hoving. The artist’s latest work is discussed in detail here. The Olson House is gifted to the Farnsworth Art Museum. It will be opened to the public for seasonal tours in 1993. The Japanese edition seen here was co-authored by Shuji Takahashi and Thomas Hoving, published by the Chunichi Shimbun and the Aichi Prefectural Museum of Art. 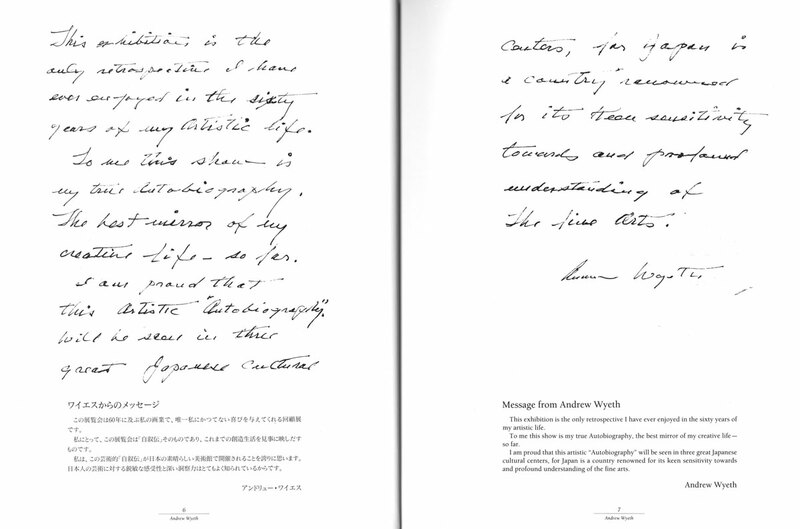 Andrew Wyeth: A Secret Life, biography by Richard Meryman. 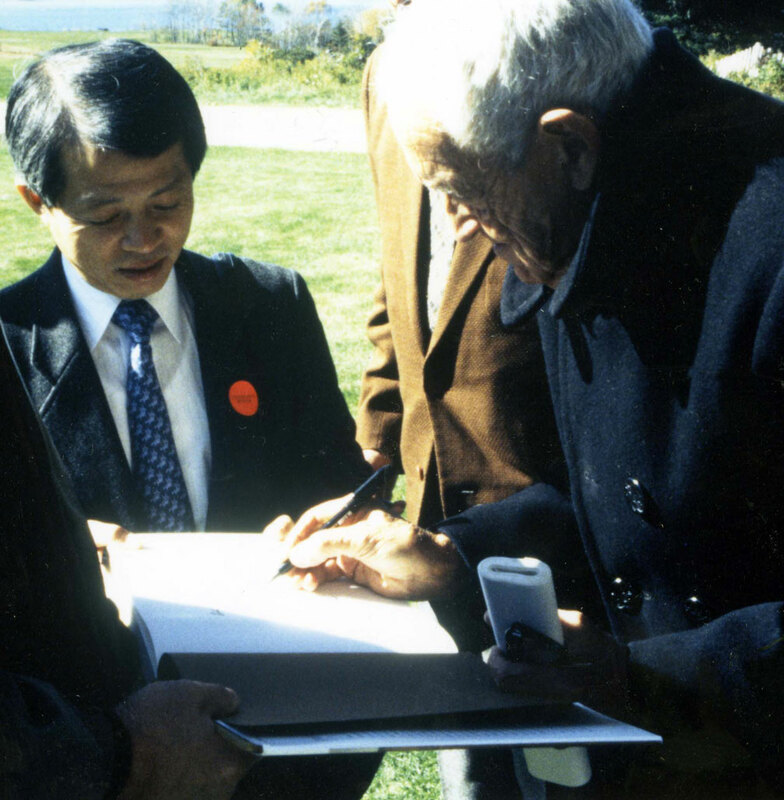 The Olson Collection is purchased by Mr. Katsushige Suzaki, a Japanese businessman and patron of the arts. The collection consists of studies for major works done at the Olsons. Mr. Susaki realized their potential to inspire and instruct students at his Marunuma Art Park in Asaka, Japan. CBS News Sunday Morning, airs an interview by Charles Osgood on the occasion of Wyeth's 80th birthday. 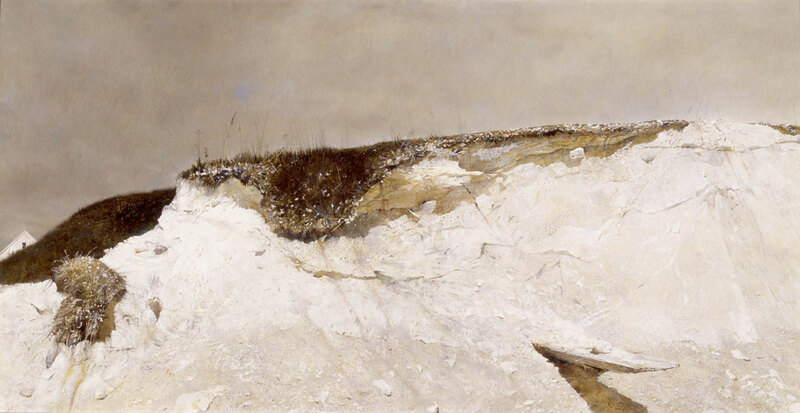 Unknown Terrain: Landscapes of Andrew Wyeth Whitney Museum of American Art, New York May 28 – August 30, 1998; Hermitage Museum, St. Petersburg Russia October 18, 1998 – January 10, 1999. 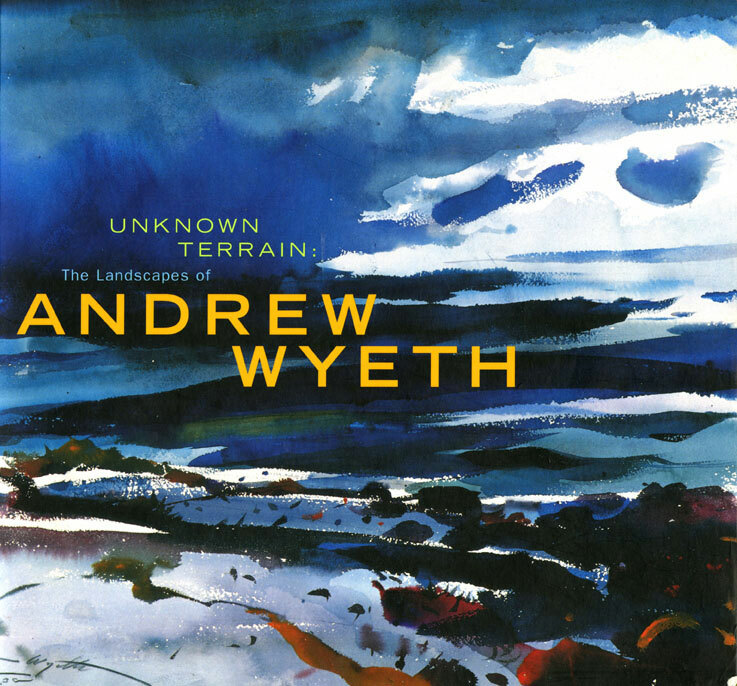 Unknown Terrain: The Landscapes of Andrew Wyeth, Beth Venn and Adam D. Weinberg with contribution by Michael Kammen. New York: Harry N. Abrams, Inc., 1998. Close Friends Mississippi Museum of Art, Jackson Mississippi February 3 – May 13, 2001; Greenville County Museum of Art, Greenville South Carolina June 6 – August 26, 2001; Telfair Academy of Arts and Sciences, Savannah Georgia September 13 – December 31, 2001. 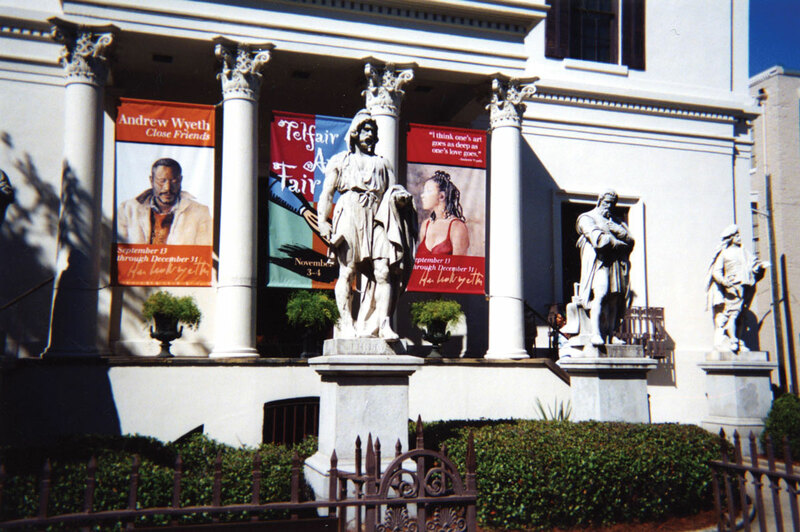 Banners at the closing venue, the Telfair Academy in Savannah, GA.
High Museum of American Art, Atlanta November 12 – February 26, 2006; Philadelphia Museum of Art, Philadelphia, Pennsylvania March 29 – July 16, 2006. The Today Show, NBC features a television interview with Jamie Gangel. Andrew Wyeth: Emotion and Creation toured only Japan: Bunkamura Museum of Art, Tokyo November 8 – December 23, 2008; Aichi Prefectural Museum of Art, Nagoya January 4 – March 8, 2009; Fukushima Prefectural Museum of Art, Fukushima March 17 – May 10, 2009.
the National Medal of Arts. 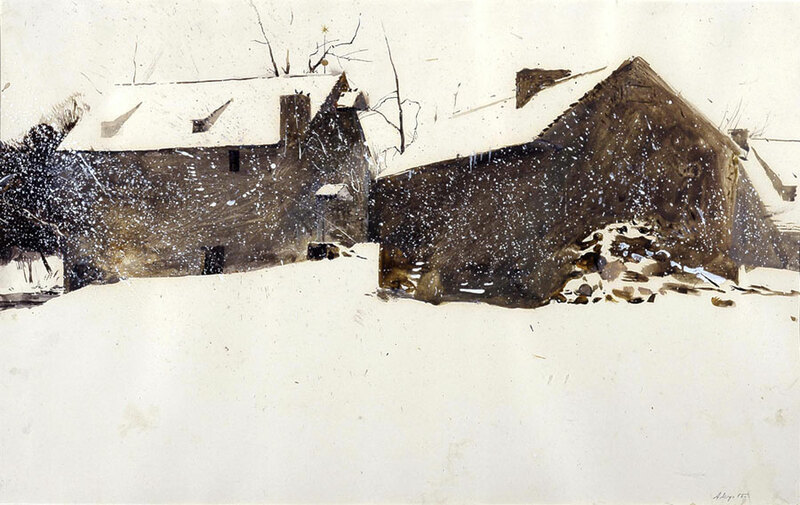 Mr. Wyeth dies in his sleep in Chadds Ford January 16. He was buried in a private cemetery in Maine. Olson House and Kuerner Farm are designated as National Historic Landmarks. 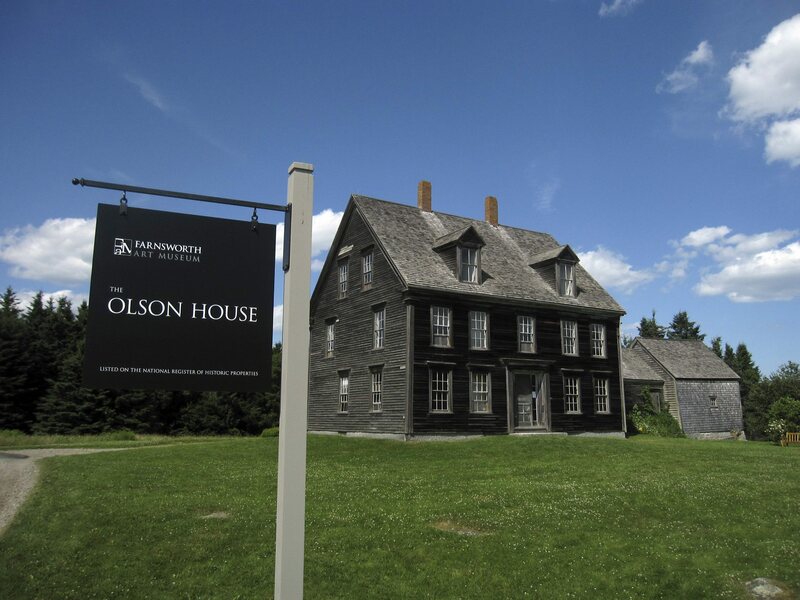 The Olson House can be visited through self-guided tours via the Farnsworth Art Museum based in Rockland, ME. 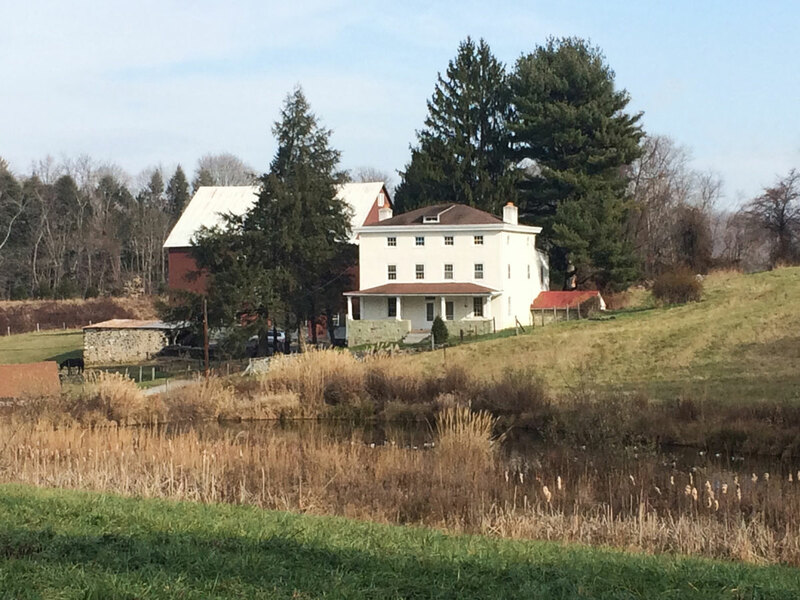 The Kuerner Farm tour is available at the Brandywine River Museum of Art in Chadds Ford, PA.
Kuerner Farm photo courtesy of the Brandywine River Museum of Art. The Wyeths: Three Generations of American Art opens at the Mona Bismarck Foundation, Paris to run through February 12, 2012. 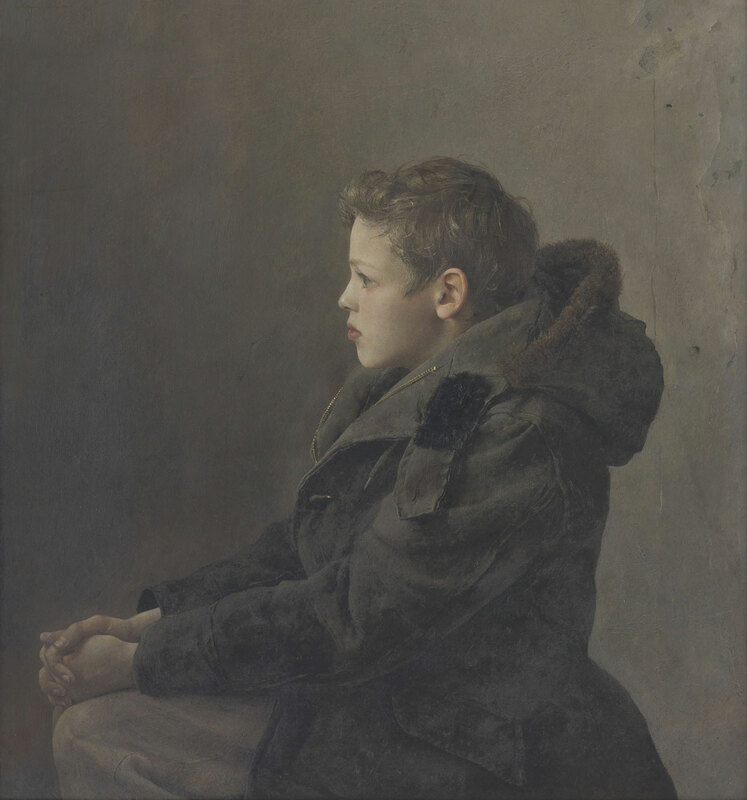 Andrew Wyeth In China  opens in Beijing and travels to Hong Kong before closing at Christie’s Private Sale Galleries in New York. The artist’s studio is opened to the public through the Brandywine River Museum of Art. The  building was given to the museum in 2010 and was restored to the time that the artist lived there with Betsy and his young boys. The studio recreates the making of Raccoon. 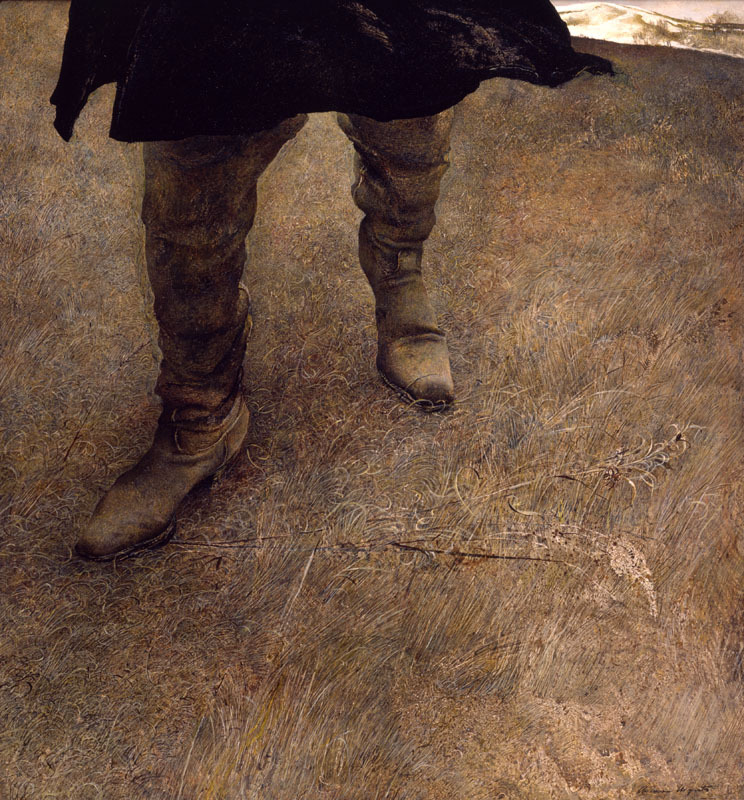 Andrew Wyeth: A Spoken Self-Portrait, Richard Meryman. Washington DC: National Gallery of Art/D.A.P., 2013. 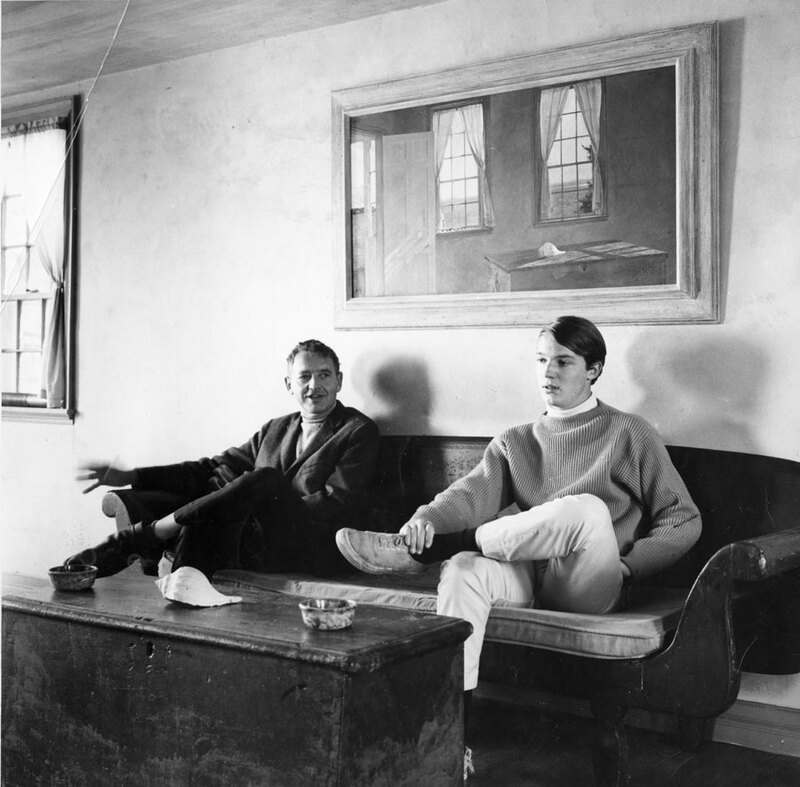 BBC Scotland airs Michael Palin in Wyeth’s World, a documentary for European audiences directed by Eleanor Yule and produced by Franny Moyle and Mhari McNeill. one of Wyeth's best-loved works. 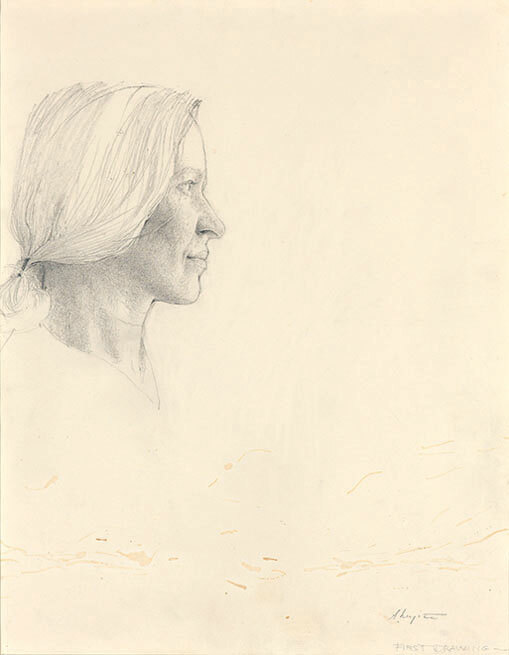 Andrew Wyeth: Looking Out, Looking In, Beth Nancy K. Anderson and Charles Brock. Washington, DC: National Gallery of Art/D.A.P. 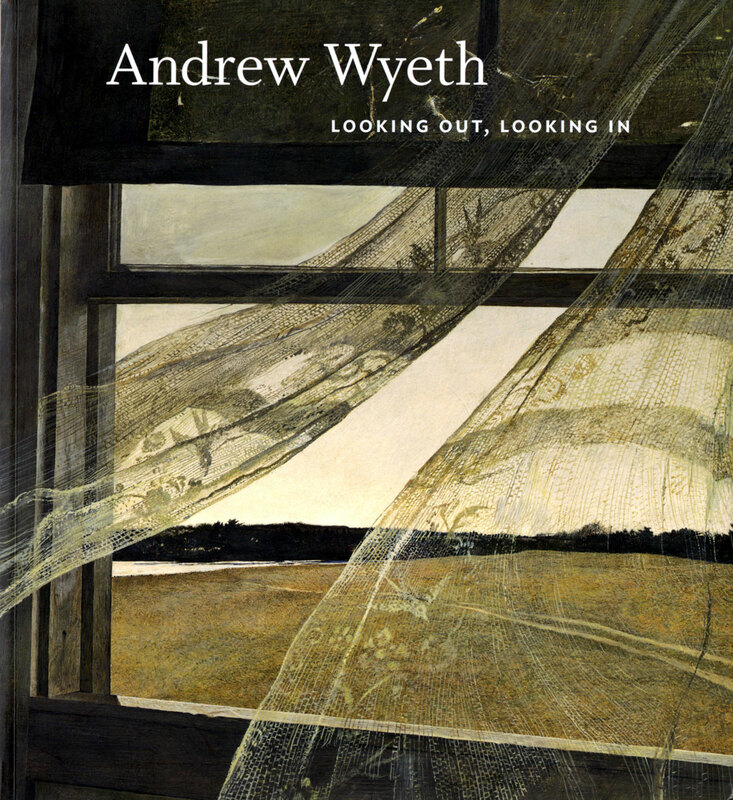 Rethinking Andrew Wyeth, David Cateforis, ed. Berkeley: University of California Press, 2014, is a critical reassessment with contributions from several contemporary scholars. 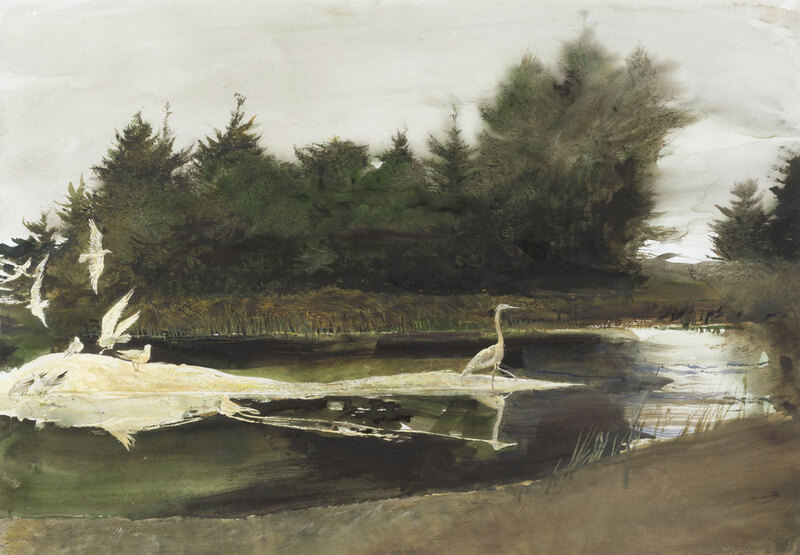 The Center for Advanced Study in the Visual Arts (CASVA) hosts “Andrew Wyeth in Context: Contemporary Art and Scholarship”, a conference at the National Gallery presenting papers on various aspects of the artist’s work. The scholars’ symposium also travels to the galleries and historic properties of the Brandywine River Museum of Art. 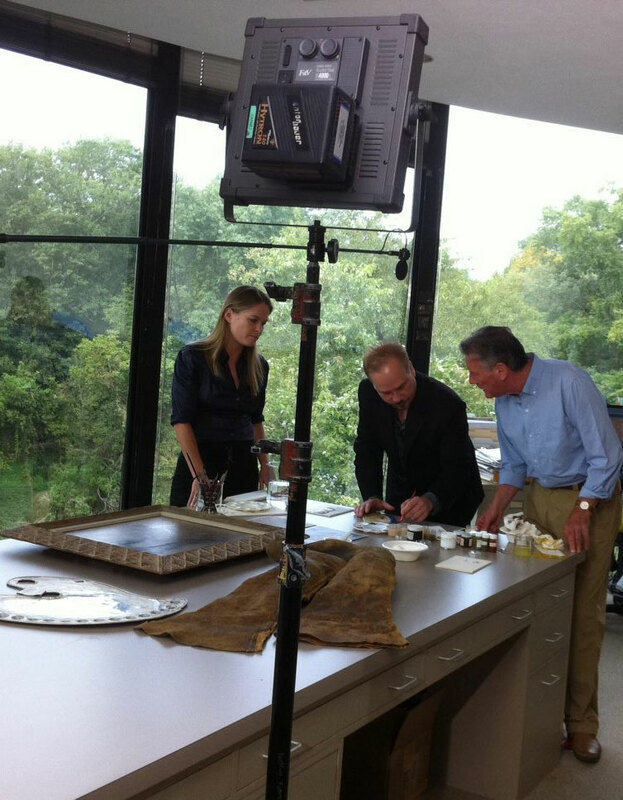 Wyeth: Andrew and Jamie in the Studio opens at the Denver Museum of Art. The exhibition featured the father and son together, exploring their working methods and technique. It travels to the Museo Thyssen-Bornemeszia March 1 - June 19 and is the artist’s first exhibition in Spain. Wyeth Dynasty opens at the Greenville County Museum of Art, the first of several commemorative exhibitions to celebrate the artist’s upcoming 100th birthday. For a full list of these venues and dates, see the list of exhibitions on this site’s research page. To mark the 100th anniversary of the artist’s birth, the U.S. Post Office issues a sheet of 12 stamps, each featuring a detail of a different painting. All images on this site are © Andrew Wyeth unless otherwise noted.